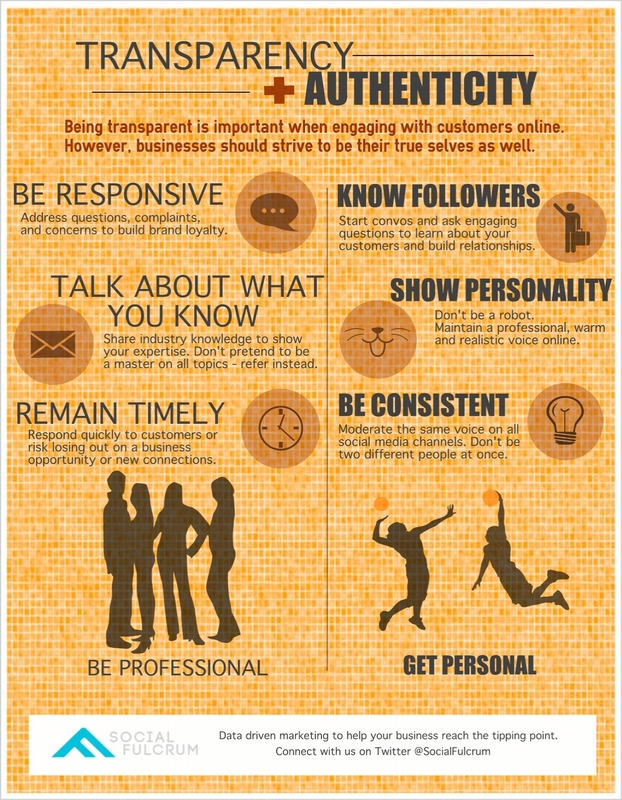 How Transparent Should Your Business Be On Social Media? It’s a well-known fact: sharing is caring. But how transparent should your company strive to be online? Transparency is a word that has gotten a lot of buzz in social media; by engaging with an audience online, businesses are able to expand their customer service and create long-term market value. However, at the cornerstone of transparency is something that is much more valued by customers: authenticity. In today’s social media world, businesses should work to strike a 50/50 balance between the two. Transparency is about being honest, open and responsible. What a business posts online directly reflects their goals and also demonstrates a level of accountability. Responding publicly to customers concerns, questions or complaints. Addressing issues brought up by the people who use your products or services creates an intimate relationship with your audience and builds brand loyalty overtime. By dealing with both the good and the bad, in an appropriate manner, you show customers that you value their business. Talking about what you know – not what you don’t. By sharing content related to your company’s area of expertise, you can establish yourself as a leader in your industry. However, if you don’t know something, don’t try to pretend and monopolize markets you know nothing about– people will see right through it and will turn to other organizations that are most honest and willing to make referrals. Being timely with communication. The blessing and curse behind social media is the idea of instant gratification; you have to respect your customer’s time if you want to capture their interest. Slow response times lead to lost opportunities and sends a message of carelessness. Getting to know your followers. Asking engaging questions or starting conversations with your audience helps you learn more about who is using your products or services. Again, this builds relationships that will ultimately convert to new business. Having some personality. Ever wanted to hang up a customer service call as soon as you heard an automated voice? No one likes to feel like they are talking to a robot. Customers tend to interact better with “real people” who are professional and warm. Posting items that you find intriguing or amusing is one way to add life to your brand’s voice. Being consistent. No one likes to feel like they’ve been two-timed. If you’re going to commit to being on social media, then you must be consistent with the content you share and the voice you promote. Don’t be friendly on one social media platform and non-responsive on the other. Make sure your company’s voice and personality is reflected across all channels to build trust. By maintaining a balance between transparency and authenticity, your company will be able to create an organizational voice that is both personable and professional — a golden attribute for building brand loyalty.